Can gamification help solve the online anonymity problem? There’s been a lot written recently about the issue of online anonymity, and in particular how Google (s goog) believes that a “real names” policy is necessary so that the Google+ network maintains a certain tone and level of trust. We’ve talked at GigaOM about ways in which Google could allow anonymity (or pseudonymity) and still maintain a healthy community, but media analyst Ken Doctor has put his finger on another option — one that some news outlets are experimenting with — and that’s “gamification,” or rewards for reader behavior and engagement. If Google is serious about creating an actual community on Google+, it’s an idea worth thinking about. Despite a torrent of criticism from users and anonymity advocates such as sociologist and Microsoft (s msft) researcher Danah Boyd — who argues that Google’s real-name policy is “an abuse of power” in favor of a privileged few — the search giant seems determined not to budge on its requirement. In a recent interview in Edinburgh, Google chairman and former CEO Eric Schmidt argued that the Internet as a whole would be better off if real names were the norm, and also made what appeared to be a case for Google+ becoming an “identity service” that the company could build other services upon. As we’ve argued in the past, there are substantial benefits to allowing anonymity or what some call “persistent pseudonyms,” including the fact that this enables those with unpopular or even politically dangerous views to use such networks, as NPR journalist Andy Carvin notes in a recent interview about his use of Twitter and Facebook. But whenever the issue of anonymity comes up, advocates say that anonymous comments allow trolling, flame-wars and other offensive behavior — an argument Financial Times (s pso) columnist John Gapper made a few days ago in defending Google’s real-name policy. The goal here isn’t simply to build core customers. It’s to bring greater civility and perspective — what Lyons calls “insight” — to the site. Readers now can mark others’ comments as “insightful,” resulting, over time, in higher ranking of commenters the community seems to value. The site Doctor describes (Redding.com, run by the newspaper in Redding, Calif.) isn’t the only news outlet to experiment with reader badges and other reward programs as a way of influencing behavior: the Huffington Post (s aol) launched reader badges last year, and although it hasn’t released any specific numbers about the effect on traffic or comments, the site’s former social-media editor Adam Clarke Estes told me the program was seen as a success both in terms of traffic and its impact on behavior. It’s not so much that badges or other rewards — Slashdot, a pioneering geek community, has long used “karma points” as a way of rewarding users and selecting moderators — cure bad behavior, or prevent trolls from coming to a site. What they do instead is make it easier to distinguish between what Slashdot calls “anonymous cowards” and those who have gained the trust of the community. Over time, it becomes obvious (theoretically) who is worth listening to and who isn’t (Jeff Sonderman at Poynter has also written about the advantages of reader badges for news sites). When I tried to describe this idea to a marketing person at the newspaper I used to work for, I had a hard time getting it across — until her young colleague said “you mean readers could level up, just like in World of Warcraft!” (s atvi) And he was right: The whole concept of “gamification,” whether it involves badges or points or other features (extra powers as a commenter, added profile enhancements, etc.) is designed as an incentive for engagement, just as the ability to add new armor or spells is in World of Warcraft. That’s not to say that “griefing” or other kinds of bad behavior don’t occur in online games or other communities with game-style rewards. But the odds are somewhat lower, simply because users don’t want to jeopardize their standing in that community. 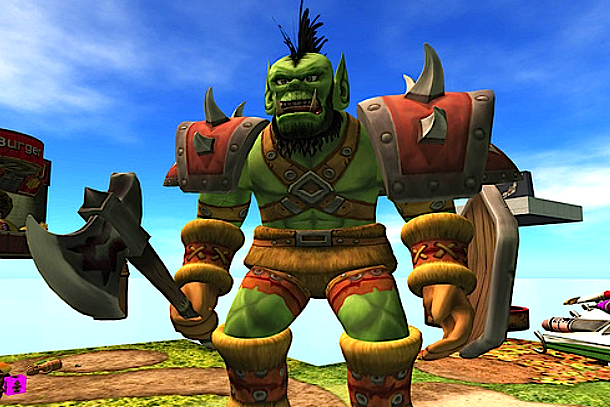 I remember a friend agonizing over quitting World of Warcraft because he had spent thousands of hours getting his avatar to a certain level of experience — it was a huge investment, and he would have done anything not to endanger that, even though his real name didn’t appear anywhere on his gamer profile. There are some key differences between World of Warcraft and newspaper comment sections, of course, and between online games and what Google is trying to create with Google+ (which may just be a way to connect people to other Google services and improve search results, rather than creating a real community). No one pays to be a member of either a newspaper comment section or Google+, and not many spend thousands of hours in these communities the way they do with WoW. But Google and other companies still might be able to take advantage of those kinds of incentives, as Redding.com is with its experimental program. Instead of simply trying to ban or exclude anyone who doesn’t want to use a real name, as Google is doing with Google+, why not try to design a system that rewards the type of behavior you want to see, and lets the users of that community decide who they wish to pay attention to? Gamification when done right taps into a user’s sense of perceived worth and vanity. This ultimately forces them to identify themselves either via their true or assumed online identity. So, in a way it does solve the anonymity issue. What Gamification also does is that it serves as curation tool for online communities by forcing good behavior e.g. if you are interested in maintaining a certain online appearance, you will watch what you say or do. Interesting article. I definitely agree that anonymity (or at the very least the option to remain anonymous) is essential in building strong, open and vocal communities. Adding gamification elements to a community and allowing members to gain status for their positive contributions, is definitely something that has worked for other largely anonymous communities such as Reddit. That said, most communities are very quick to site and report trolls to admins – if the community is strong, its members will take ownership of it, and will play an active (and sometimes lead) roll in the elimination of misconduct. Love that you’ve linked these ideas. At the core of ‘gamification’ is the understanding of core human drives which can then be worked in to the design of the system. Most are trying to use those insights to increase usage metrics that drive revenue which is different than cultivating the behviours that help communities thrive and why I think there are a lot of ‘disappointing’ experiments. In theory, it’s definitely possible, but in practice it needs some serious thought and a real desire to improve the quality of the community in the comments. Will be interesting to watch what the comment systems do – like Disqus experimenting with the ‘level’ badges in blog communities. I think there is room for both kinds of social services: real ID and anonymous. It’s not one or the other. You don’t necessarily want to mix them up. Identity services (like Google+) can be very useful in business transactions; it can provide a way to pass on a link to your identity information to potential customers or service providers without filling out forms, etc. Think of AppleID or Amazon.com account, just more portable. Anonymous identity is a necessity for some people – professionals who have insider information or have unusual influence financial and/or political, who are professionally barred from participating in the social media with their real identities for good reasons. Do we want these people’s insights and opinions excluded from blog-o-sphere? At the same time, anonymous identities should not be too easy to create, as described in the article. I’ve been online since 1981; first on BBS’s and then on the internet. Here’s why I prefer anonymity: I don’t want the history of all comments that I’ve ever made in my life out there, forever, for anyone to research and compile. The internet never forgets. In the past 30 years, I’ve debated in a wide range of topics. Sometimes I was flat out wrong. Sometimes I let my temper get the better of me (as everyone does, on occasion). Sometimes history has proven me wrong. I plan to continue engaging in online debates, because it’s one way that I learn. I’m not a politician or a celebrity; I don’t want to spend my life defending past statements. Very frequently, I see online debates degrading into an attack on the credibility of a particular source, rather than a debate of the facts. I already see on one particular site that I go to, that some folks are compiling personal information on their ideological opponents, and have no aversion to publishing personal information. I prefer the choice to be anonymous when I want to be anonymous, and to be public when I want to be public. I don’t want that decision forced on me, to be public all the time. As a long time Slashdot user (a low 2-digit user ID) and having excellent “karma” for forever I’ve seen the system work in both good and bad ways. Let’s get a few things out in the open about Slashdot’s moderation system. 1. It doesn’t necessarily discourage trolling or SPAM because comments are still posted and require active community moderation. It does mean that eventually the score on a comment drops to “-1” so it won’t be seen by non-logged in users (without intervention) or logged-in users that choose not to view comments below a certain threshold. In other words, there is a time delay. 2. Trolling and SPAM still occurs on both registered accounts and anonymous (aka “anonymous coward”) accounts. Deletion of accounts doesn’t always help. IP accounts bans can be bypassed. 3. The biggest issue in the Slashdot system is the persistance of groupthink in comment moderation. There are certain accepted paradigms on Slashdot that cannot be contravened without a community moderator using their points as a means to either reward or punish the stated opinion. This is very apparent in discussions that veer off the normal tech-related content of the site such as issues of religion, politics, immigration, etc. The fact that comments can only get a score of “-1” to “5” no matter how many up- or down-votes they gets prevent wholesale punishment of unpopular opinions that we see on places like Digg. However, the situation isn’t ideal because it keeps happening. I often find myself browsing at “-1” to find the interesting comments that were hit early on or anonymous comments that weren’t seen by moderators. 4. The Slashdot moderation system also doesn’t necessarily reward factually correct comments but rewards comments where the commentator sounded authoritative and didn’t make too many obvious mistakes. Usually a lower-scoring reply will usually (but not always) straighten things out but the original commentator’s “karma” has already been given a bump and may continue to provide information that isn’t 100% correct. 5. Slashdot has a system of meta-moderation where comment moderation is moderated. The question is simple: “Do you agree with this comment’s score?” The answers feed back into the system so the round-robin system of giving out moderation points either increases or decreases the frequency of that particular moderator’s participation. It’s a good idea but it hasn’t fixed issues noted in items #3 and #4. One of the biggest reasons communities fall apart once trolls show up is because people start to respond or take comments personally. People end up with hurt feelings or become afraid to post because they can’t handle a troll properly. So what does this all mean? It means the same thing many of us have said: trolling and SPAM can only really be solved through ignoring. In fact, banning overly emotional “regulars” that can’t ignore trolls may go much further than worrying about tactics directed at trolls themselves such as real-names, moderation, IP bans, etc. Lastly, the entire non-anonymity-prevents-bad-behavior meme is starting to get played out. In the real world we’re not anonymous but that doesn’t prevent people from doing things that go against the values of society: crimes are still commited, that creepy uncle still looks at his nieces inappropriately, a friend makes a racist comment at dinner, road rage still occurs, etc. We’ve set up intricate systems in the real world to deal with these issues but we haven’t found a solution that works. In other words, there is no “Stepford” community in the real world and trying to create one online is just as futile. What’s the solution? Ignoring. There is too much value in anonymous comments to ban them outright. There is also an issue with having everything someone has said easily searchable on Google. The implications of these real-names policies online will have serious ramifications down the road in the real world. I just hope commentators understand this before leading us all off a cliff. Thanks, anonymous — I certainly wouldn’t argue that Slashdot’s system is perfect by any means, but I still think it has a lot of features that other communities could learn from. Anonymity help to make sure that the wrong people don’t get your real name and use it to spam,stalk,or steal your identity. It also makes true Free Speech possible with out some one who didnt like what you said coming after you. I for one will not be using google + until they allow anonymity. Everybody is good, I think in the online revealed there are always two sides to everything, real name good one side is it will let us have more friends, may make lifelong friends, but there may be some people will malicious abusive or do other contravenes laws. Of course, real name or revealed to consider.This winter you still do not dare for fear of cold feet out it? You also because no pair can be proud to wear the boots out of frustration over it? Now you can put these forget, here http://www.aliexpress.com/fm-store/316403 on your paradise, a pair of warm and give you unlimited, perfect snow boots feel comfortable, meet your winter feet of demand, piercing a woman’s taste, piercing the man’s pride! When considering their effects on the site’s community, it seems potentially misleading to discuss Slashdot’s karma points as “gamification” and ignore the user tools associated with karma on Slashdot. The more karma points you accumulate on Slashdot, the more frequently you can moderate others’ comments, effectively adding or removing others’ karma. The points themselves are a mechanism to facilitate large-scale collaborative moderation of the actual community; relatively early on, Slashdot actually tried to de-emphasize the “scoreboard” component of it by hiding users’ actual karma number and substituting bands, so that users would focus on the process rather than the actual number of points. Slashdot did add an “achievements” component at some point after Foursquare’s badges grabbed the Internet’s collective imagination, but it was well after the site’s glory days. The reward that high karma users received wasn’t a badge, but the ability to very directly shape the site into the community they wanted. Everybody is good, I think in the online revealed there are always two sides to everything, real name good one side is it will let us have more friends, may make lifelong friends, but there may be some people will malicious abusive or do other contravenes laws. Of course, real name or revealed to consider.This winter you still do not dare for fear of cold feet out it? You also because no pair can be proud to wear the boots out of frustration over it? Now you can put these forget, here http://www.aliexpress.com/fm-store/316403/211163894-490396050/Free-Shipping-Quality-goods-Australian-fur-one-3-button-Russian -boot-PR0038-black-boots.html to your paradise, a pair of warm and give you unlimited, perfect snow boots feel comfortable, to meet the needs of your feet in winter, wear a woman’s taste, piercing the man’s pride ! That’s a great point, Whitney. In order to be effective, gamification has to be more than just points or badges — it has to actually tie into something meaningful about the way a user interacts with the site. Shouldn’t we talk about comment systems? Why can’t I determine which comments show in my context. I personally don’t care what a group has to say. Comparing the very early Slashdot to today. In the early days experts with different views exchanged their views, now there are repeaters [common knowledge repeated over and over to show how “smart” they are]. From where I stand it all comes down to context[what I know and believe to be right and accept to be challenged(there are boundaries)] and using it to skip/filter junk including repeaters. Same goes for all other systems including search results. In other words its a general deep tech problem and has not much to do with if I know the name of the people I talk to. Or: Even if I know your name that doesn’t make your comment “smart” from where I stand. Can I get your addr., phone number, ssn …, while we are on it, so I really know who I’m talking to? Doesn’t mean I care what you have to say, just might have some creative idea how to use that data. Thanks, Ronald — I agree that filtering is part of what online communities have to offer as well. I agree with Bryan about Yahoo answer aspect and the gamification. Although the Google 1 + button like concept may be useful which to some extend solve the online anonymity problem. Yahoo Answers has long used gamification (points, levels, badges, etc.) to reward users for helpful answers. Now, go spend 30 minutes or so on Yahoo Answers, and let me know if you think it is a high-quality community. You know what? I’ll save you the time: Yahoo Answers is a wretched hive of trolls and spammers. Do you still think that gamification is the solution to this issue? Bryan — Yahoo Answers might use game mechanics to drive user behavior, but maybe it’s using the wrong game mechanics. Another example of a Q&A site that gets game mechanics right is Quora. They are very careful in their gamification techniques, as they focus on promoting and rewarding users for high quality content only. Yelp, though not a Q&A site, is the same way. Good points, Adena — thanks for the comment. I’m a huge fan of applying insights from game UXs to just about everything, and really like Silas Lyons’ take in the Nieman Journalism Lab article you linked to: “Weâ€™re trying to solve an engagement problem. The reader is being rewarded for consuming, sharing, commenting, and finding insight.â€ So yes, I think there are definitely possibilities here. Unfortunately most applications of gamification focus primarily on the competitive and bragging-rights aspects, which tends to give prominence to the people who are into that. And since the stakes are high with Google+, there needs to be a lot of thought about how to make the “scoring” resilient to bad actors. Good point by the way on Slashdot. Their karma/meta-moderation system remains state of the art, and it’s surprising that nobody’s learned from them. Thanks, Jon — I’m surprised more sites haven’t learned from Slashdot as well. I did not write this, but I feel this article is extremely relevant. Is Gamification all it’s cracked up to be? I’m not so sure. That article said very little very eloquently. All ‘gamification’ aims to do, when it’s deployed effectively, is reenforce user behavior that is valued within a certain community. The reason marketers have attached themselves to the concept is because they can sometimes use game dynamics to coerce users to do what they might not otherwise see value in (i.e. share an ad with friend, or leave a comment, etc). There are plenty of “legitimate” uses for reward systems, though, within online communities. Good points, Seth — thanks for the comment. Google has it all wrong. Anonymity does not undermine the validity of online engagement. Does it matter if my name is “<<>>” or “Jason Thibeault?” What matters is what I say. That’s where gamifcation can really help because even if I have one or more “personas” with which I engage online, I want people to know that those are me, just like I am attached to my gamer tag on Xbox Live. I am seeing it more often in analysis/discussions like these, but we seem to be having difficulty reconciling our digital and real selves. They are two separate “states of being” without a doubt. Google’s push for real names attempts to force the two together but I’m not sure people are ready for that. Some are. I, for one, love to log into comment services like this with my Twitter/Facebook account. It’s easier (I don’t have to remember more usernames/passwords). That automatically associates my name with my comments (which is okay as I am trying to bridge my online and real-world personas through brand building activities). But to assume that everyone wants that simply underlines the fact that we don’t have a handle on this very complicated psychological issue yet. Jason, I couldnt agree more and I think gamification is just another way to make users jump through hoops, but what few stop to think about is the value proposition in that for not only the site but the users. I dont see much value to be honest and until the exchange for our valuable time is equitable to many, there wont be a value in it. I dont use my real name on my goggle+ account or any email I have ever used online in nearly a 20 year online presence. If google presses it I will simply tell them to shove their + deeply where the sun dont shine! I still have my consumer power contrary to what they and many others online want to believe!